Tuesday, December 11, 1979—got up at 3:45 a.m. and got to Cal’s at 5:00 a.m. He has invited me to ride in his snow track with him and his son Ernie on his trapline. It was such a day that trappers don’t like. We didn’t get any fur. I did get two ptarmigans and when I shot these ptarmigans, I walked over to pick them up and lo and behold there is overflow on the ice! The snow is about a foot deep and the overflow wasn’t obvious when I started for the ptarmigan. I got out on it and broke through a thin crust of ice and not knowing how deep the water was, I didn’t want it to go over my Sorel boots and get my feet wet. 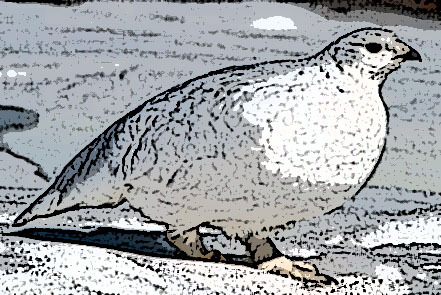 It’s very cold so I laid down on top of the snow which held my body in that manner and then I rolled off the area of the overflow—I did take the ptarmigans and rifle with me. We saw quite a few other ptarmigans but we didn’t shoot any more. Saw some caribou and lots of moose, but we didn’t see any bulls. There may have been moose that had lost their horns and at a distance, it’s hard to tell a bull from a cow and be positive about it—for me anyway. I really enjoyed the trip. It was fun and I thanked Cal for taking me along. His trapline is 73 miles out, and the temperature was -25° to -35° depending on the elevation of where we were at the time. This entry was posted in Journal Entry and tagged hunting, ice overflow, ptarmigan, trapline. Bookmark the permalink.